Vacation. When I hear this word (whether it's my vacation or someone else's that's mentioned), I tend to unconsciously let out a sigh. Just the mention of the word seems to trigger an immediate release of enormous doses of dopamine and serotonin in my body. Vacation is one of those wonderful times when (many people) unplug from work. It allows us to recharge and is good for us. Sometimes we don't realize how much we need a break until we actually step away for a while. When you rest your mind, it is more open to accepting ideas and being creative. Have you ever noticed that when you're lying in bed or taking a shower, ideas seem to come to you more easily? I certainly have. I've even noticed that it happens when I just stop what I'm doing and sit quietly for a few minutes. Being still allows you to let go of what is clouding your thoughts and open your mind. It's during these times when creativity flows. For the last eight years, we've spent a week in the summer at a small cottage by a lake in New Hampshire's lakes region. My perspective changes when I'm away. Although I still cook, wash clothes and clean up, my "regular" routine is different and I have more time to relax, refresh and recharge. And I tend to write better (or at least more easily), have more ideas, and feel more at peace. I feel that I am more aware--or as some of my favorite meditation experts say, more mindful. ​I decided that I want to feel like that more without having to escape from my daily life to do so. I know that it will help me in so many different ways, like being a better,more patient and more productive wife, mother, daughter, friend, creative person, and member of society. I've found a path to having more peace and creativity in my life. In the last several months I've begun to meditate. Keep reading, it's not some woo-woo craziness. By meditating, I mean that I've purposefully set aside time each day to be still. It's typically at night when I have a dark, quiet place to sit. I've begun with short guided meditations from YouTube, where someone walks you through what to do. It's been really helpful as a beginner. I focus on something (usually my breath) and when my thoughts wander, I turn back to noticing my breath. It's a practice that is easier some days than others. But it's a learned skill that trains your brain to go to a place of serenity. Over time, I know that it will get easier and result in more mindfulness, awareness and openness in my life. In the short time I've been practicing meditation, I've learned that I can get to a place where my mind is still (-ish) and that wonderful feeling that I have much of the time when I'm on vacation. If I can get to that place during meditation, my goal is to be able to reach that point in my daily life without even having to try, and be able to enjoy a more creative life. I have a feeling that it will be a lifelong journey, but baby steps and consistency lead to big things. Do you meditate? I want to hear about it. Let me know what your journey has been, and how it has changed your life. I was the kid who always had paper in front of her and crayons in her hand. I was the kid who doodled all over the TV Guide, tracing the letters and drawing pictures on it. I was the girl who loved to take the junk mail and scrap paper to keep as a stash to write and draw on. I was the girl who drew Tippy from my parents’ matchbooks and mailed it in, hoping to be recognized. hoping to win the prize. I was the teen who finally found an art teacher who took an interest in teaching her how to draw and had talent from which I could learn. I was the teen who wanted to go to art school, but whose practical parents talked into getting a business degree. that was screaming to be freed. Like anyone, I get sick and tired of my stuff. From wall color to accessories to furniture, sometimes I just want a new look. For as many times as I’ve looked around my house and wanted to change everything, if I dished out the dollars to do it, I’d be broke—or up to my eyeballs in credit card bills! So, I do what my mom taught me. Reuse, recycle and repurpose. When we were growing up, my mom made bubble solution from dishwasher liquid; covered school books with grocery store paper bags; salvaged my dad’s jeans by covering holes with patches of material from older jeans; made Halloween costumes from leftover, hand-me-down material; and wrapped kids’ gifts in Sunday funny papers. My mom would come up with all kinds of great ways to reuse, recycle or repurpose materials. I can’t say that I’m as good as my mom was, and still is, about reusing, repurposing and recycling, but I try. My creativity usually comes out of need. There’s a mess on my countertop, so how can I organize everything? Or I have a project with no budget and I’m forced to find style and function in what a client already owns. I immediately look around to see how something can be repurposed. You may be surprised at what you find around your house that can be used for a purpose other than for what it was originally intended. Keep an open mind and think about function. If you need storage, look in your attic, garage and around your house, and question how an item might be used to store your articles. If you are looking for an accessory, look in your closet, cabinets and drawers, and determine whether the shape, size and/or color of the objects may work in your space. Don’t discount pieces too quickly. Sometimes a little work, like a coat of paint or some light renovating, can create something that is completely different from how it began. If you need some instruction, there are plenty of ways to find it, like YouTube, Pinterest, or home improvement stores. Don’t be afraid to make a mistake. Your new item may not only be a functional part of your home, but it may also become a wonderful conversation piece! Do you have a child who will be leaving for school soon? Are you anxious to get into his/her bedroom in hopes of giving it a makeover? It would be fun to give your child a newly-designed space for weekend visits. But I would caution you that it may not be the best idea to make it a complete surprise. 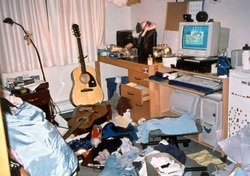 Before your student moves out, work with her to de-clutter closets and storage spaces of clothing and memorabilia. You don't want to make assumptions yourself and donate or toss anything that she isn't quite ready to part with yet. Cleaning out the bedroom will not only give your child a head-start on getting ready to pack for school, but also help in your quest to make the space over. Moving out of the house can be an emotional time for your child. Holding on to certain memory-evoking items--and even taking them to school with her--can help ease the transition. Putting together scrapbooks, photo albums, bulletin boards and memory boxes are great ways to corral these items and keep them safe. It may be a project you can work on together, or maybe give her as a going away gift. Once all of the personal items are cared for, you're able to begin the actual transformation of the space. Giving the room a good cleaning and painting will be much easier after it is de-cluttered. You may be able to eliminate some of the furniture in the room. Talk to her ahead of time about how she will need the room to function and determine exactly what pieces she will need. Will she need more than a bed and dresser? Will she be doing homework and need a desk? A bookcase? A comfy chair? You will not only be creating a great new space for your child, but also, in a way, helping yourself transition through this next step in her life. Have some fun. I want to Receive Blog Updates!